PowerController MCE is a multi-standard Home Automation Add-In for Windows Media Center, controlling electrical devices that run on the Bye Bye Standby/ Domia system, Z-Wave and Mi Casa Verde devices, as well as IP webcams. Monitor webcams round your house from your media center PC. PowerControllerMCE support both Bye Bye Standby, Z-Wave, and Mi Casa Verde devices, all in one control system. Mix and match devices as you build your system. See which devices are on and which are off round the house – no matter how they were controlled – via the PC, a switch, remote control, over the web. PowerControllerMCE will keep track of it all. Turn devices on and off at scheduled times or at sunrise and sunset. Make your house look lived in when you are away, or just make sure everything gets turned off at night. Or have your hi-fi or TV turned on in the morning automatically. Offset the events by a random amount each day for that extra lived in look. In addition to media center control, a touch enabled web interface is available – ideal for a PC, tablet or smart phone. 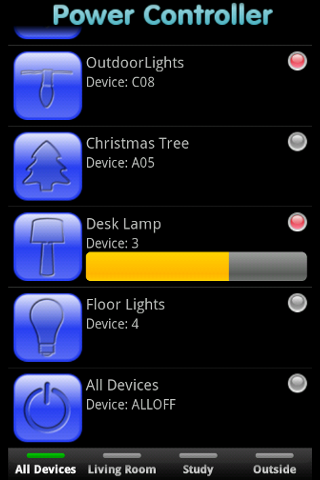 PowerControllerMCE can control multiple different home automation systems. To control BBSB devices, you need to have one or more Bye Bye Standby plug sockets, and the Bye Bye Standby Controller. If you are looking to buy some, Nigel at the Smart Green Shop has been very helpful sourcing different items for me, and has the best price I have seen on the Online Controller. If you want some plug sockets, the best price I have found is online at Currys at £19.99 for three, plus you can get 3% cashback on that at TopCashback, and pick them up in store for instant gratification too! To control Z-Wave devices, you need to have a Z-wave USB controller, e.g. the Aeon Labs USB controller, and one or more Z-wave switches. 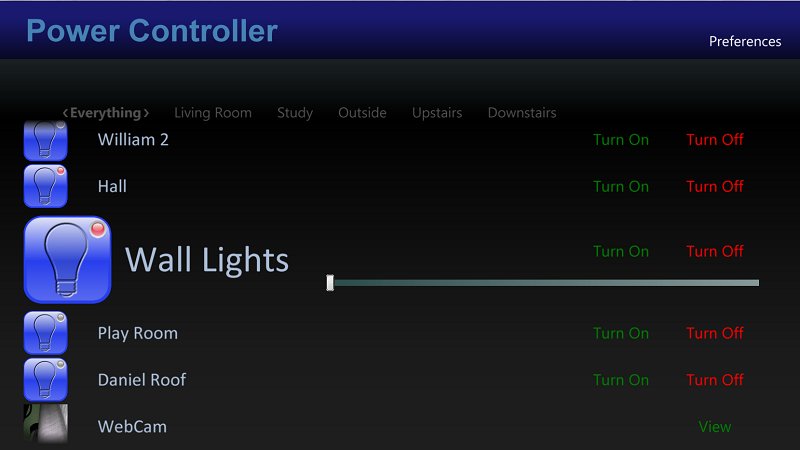 PowerControllerMCE can control both switches and dimmers from Z-Wave. Z-Wave is a bit more expensive than BBSB, but has the advantage that it supports two way communication, so acknowledges that it has been turned on, which leads to more reliable communication. It also uses a mesh network, so can travel further distances overall. To control Mi Casa Verde switches, you need to have a Vera or Vera 2, or any other MiOS based controller. PowerControllerMCE will turn switches and dimmers on and off and dim them. It will also monitor the status of the devices every 10 minutes in case they are switched by another system. The Vera has it’s own web interface, but adding PowerControllerMCE to your PC allows you media center control too, and a cleaner web interface. PowerControllerMCE works best when used with an always on PC so that it can always listen for power state changes. If you don’t always have your media center PC on, you can install PowerController on Windows Home Server, and leave it running there all of the time. If you want to run PowerControllerMCE on multiple PCs round your home, you can designate one of the PCs, or your home server, as the master device, and all of your settings will then be shared from that machine. 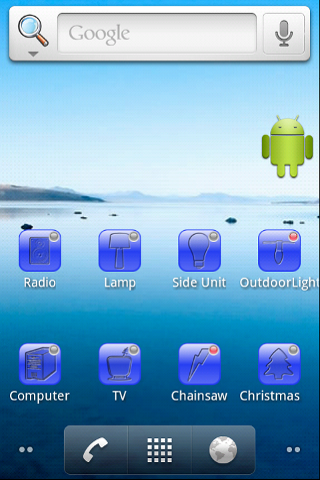 There is also a companion Android phone application which can be used to control your power devices. It will read all of your devices from your PC so that you don’t have to type them in again, and which will share the device status from your PC, displaying widgets to show you what it on and what is off. At the moment it is just compatible with BBSB, but Z-Wave is coming soon. Download the app from the Android Market by searching for Power Controller. Like the software? Want to help to fund maintenance and development? All donations are welcome, no matter how small. Just click here to donate securely via PayPal. Thanks to Tom Hall from Hong Kong for funding some Z-Wave devices to allow this project to expand to support multiple protocols. Thanks to Stuart Harrison for extensive testing of the code. Note: To install a new version, you first need to uninstall the old version. 3.3.2. Fixed a locking issue. 3.2.1. Fixed a bug with non-switch Z-Wave devices. Added Scenes to the settings. Note, you will need to re-set your web password with this version. Added the ability to have a random offset for events. 3.1.0. Added basic web page for controlling devices. 3.0.1. Update for better mobile integration. 1.3.1 Fixed a bug with event times creeping. 1.2.0 Added the ability to schedule events. Fixed an issue with scrolling down long lists. Source Code is maintained at Sourceforge. Please note, MillieSoft is in no way associated with Domia, Bye Bye Standby, MiOS or Mi Casa Verde.